The Museum Correr, directly on St. Mark's Square, is one of the most important museums in Venice. It is both an important art museum and a historical museum. The public Museo Correr is owned by the city of Venice. The Museum Correr can be visited as part of a combined ticket for about 20 euros (as of the beginning of 2019), which also includes the Doge's Palace and some other museums around St. Mark's Square. With the ticket for the world-famous Doge's Palace you can also visit the Museum Correr for free. Both are top sights at St. Mark's Square. Often very long queues form at the entrance, especially at the Doge's Palace. Not only in the high season there are often extremely long waiting times (one hour and more). To our knowledge there is only one possibility for tourists not to have to queue in the long queue. You buy a ticket online in advance. Guided tours, tickets and further information can be found on this website. The name of the museum goes back to Teodoro Correr. He was a wealthy citizen of the city of Venice (1750-1830) whose passion and life's work was collecting things. After his death he donated all objects of the city of Venice. These included, for example, more than 10,000 manuscripts, some of them very valuable. The Museum Correr is divided into two parts. One part contains historical objects from the city of Venice. These include, for example, weapons, maps, technical instruments, coins, statues and clothing such as uniforms and costumes from the great time of the city. A great sight are also the many ceramics, especially the vases. The other part in a gallery. Here you can see many famous works of art by artists from Venice. From some windows in the Museo Correr one has a marvellous view to the Piazza San Marco. Famous pictures in the Correr Gallery (some examples): Giovanni Bellini: Crucifixion (1460, Crocifissione), Vittore Carpaccio: Two waiting Venetian women (1490, Due Dame Veneziane, probably the most important painting in the Museo Correr), Vittore Carpaccio: Man with red hat (about 1492, Uomo con berretto rosso). Other famous paintings include Bartolomeo Vivarini, Lorenzo Veneziano, Antonello da Messina and Paolo Veneziano. Important works of art by important foreign painters such as those from Germany, the Netherlands and Belgium (Flemish) are also among the highlights of the Pinacoteca (Pinacoteca) in the Museum Correr on St Mark's Square in Venice. As far as we know, the building can only be entered with the "Sr Marks Square Museum Ticket", which also includes the Doge's Palace, the Archaeological Museum of Venice and some smaller exhibitions. The entrance ticket costs 20 Euro for adults. Different groups of people pay only 13 Euro entrance fee. This includes students and pupils under the age of 26 as well as all persons over the age of 65. You have to show your identity card or student card. The entrance fee to the Museum Correr is free for children under 6 years. Meanwhile (in 2019) you can also go to the Archaeological Museum via the entrance of the Correr Museum. This is in the same building at St. Mark's Square. You can walk back and forth between the two museums as you wish. In summer the museum is open every day from 10 a.m. to 7 p.m., including Monday. In winter (November to March) the opening hours in the evening are a little shorter (daily 10 to 17 o'clock). For some time now there has also been a larger museum pass for over 10 museums in Venice. You can find more information about this on our page about the Doge's Palace. 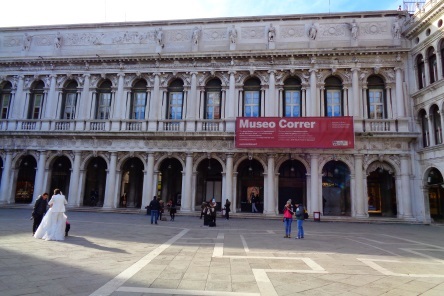 The Museo Correr is from the Doge's Palace on the other side of St. Mark's Square.